Once I got the hang of maintaining a sourdough starter I found myself with copious amounts of the discard. What to do with it? I did some searching online and after sorting through hundreds of sourdough starter pancake recipes I decided to try my hand at convering a conventional recipe. The end result was a series of drop biscuit topped vegetable pot pies that were acceptable but had an odd aftertaste that I did not particularly like. And then I wondered what would happen if I made biscuits with it. I always have buttermilk in the refrigerator and I love biscuits so it seemed like the thing to do. I played around with the ratio of starter to buttermilk and whole wheat flour and came up with a combination that works for me. These biscuits are not exactly the same as my regular buttermilk whole wheat biscuits. They are a little more crisp than those, and have a slight hint of the taste of saltine crackers which actually goes well with the crisper texture. I actually find that I go to make these more often than the original version though, so go figure. If you find yourself with extra starter hanging around and you do not want to waste it, give these biscuits a try. 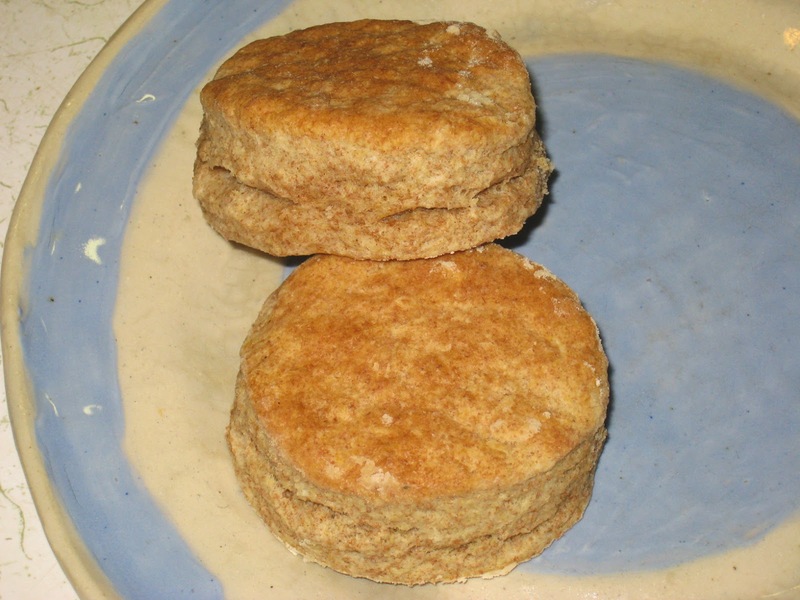 They are quite delicious and no more trouble to make than regular biscuits. Stir the buttermilk into the starter, then add the eggs and mix together. Sift together the flour, salt, baking powder and baking soda. Cut in the chilled butter. Make a well in the center and add the starter mixture. Stir until it just comes together. Turn the dough out onto a heavily floured surface. Knead a few times to bring the dough together. Roll the dough into a narrow strip aout 6 inches wide, then fold into thirds along the length. Rotate the dough 180 degrees and roll it out agai into a narrow strip, then turn and repeat one more time, rolling the dough out about 1/2 an inch thick. Cut out the biscuits and place them closely together on an ungreased baking sheet. Roll and fold the remaining dough and cut ito biscuits until the dough has all been used. Bake for 10 to 12 minutes, until the biscuits are slightly browned. Remove from the oven and serve warm.